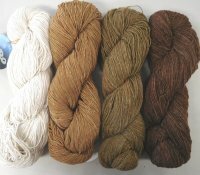 Fun yarns to work with - the color combinations are interesting and more unexpected compared to other commercial and hand dyed yarns with long repeats. In the last couple of years Noro has been adding more merino into the mix to make it softer than it was in the past. In stock 2/26-will get it online next week!